Immigration law — Immigrants — Sponsorship applications — Members of family class — Children — Dependent children — Application for immigrant visa — Humanitarian and compassionate considerations — Practice and judicial review — Judicial review (incl. jurisdiction of court) — Grounds for — Application for judicial review of refusal of application for permanent residence in family class allowed — Applicant was 17-year-old citizen of India whose mother applied to sponsor him, with humanitarian and compassionate request — Officer found applicant inadmissible since neither parent declared him upon entry — Officer called family in India and determined applicant lived in school hostel and other family lived with grandparents — No error in inadmissibility finding — Officer failed to identify whom she spoke to and did not address primary submission that grandparents were aging and other family was not willing to care for applicant. Immigration law — Exclusion (inadmissible persons) — Grounds for inadmissibility — Inadmissible family member — Inadmissibility findings — Judicial review — Application for judicial review of refusal of application for permanent residence in family class allowed — Applicant was 17-year-old citizen of India whose mother applied to sponsor him, with humanitarian and compassionate request — Officer found applicant inadmissible since neither parent declared him upon entry — Officer called family in India and determined applicant lived in school hostel and other family lived with grandparents — No error in inadmissibility finding — Officer failed to identify whom she spoke to and did not address primary submission that grandparents were aging and other family was not willing to care for applicant. Application for judicial review of the officer’s refusal of the application for permanent residence in the family class. The applicant was a 17-year-old citizen of India. The applicant’s father became a permanent resident in 1997 and did not declare the applicant, who had been born in India in 1994. The father sponsored the mother, who also did not declare they had a child. Once the father became a citizen, he applied to sponsor the applicant, but the applicant was found to be inadmissible since he had not been declared. The father’s second application with a humanitarian and compassionate request was also dismissed. The mother then applied to sponsor the applicant, with a humanitarian and compassionate request, on the basis the applicant was living with grandparents who were aging and could not longer care for him, and there was no other family willing to care for him. The mother also submitted that she and the father longed to be reunited with the applicant. The officer found that the applicant remained inadmissible and an H&C exception was not warranted. The officer rejected the parents’ various excuses for not declaring the applicant and made phone calls to the applicants’ family in India. The officer noted she had learned that the applicant lived in a hostel during the school year and there were other family members living in the grandparents’ home, where he retuned during school holidays. The officer found the applicant’s parents could still communicate with him and visit him and their separation from the applicant was their own doing. HELD: Application allowed. There was no error in finding the applicant was excluded as it was quite clear both his parents failed to declare him. Information obtained from the family was readily available to the applicant and his parents. However, the officer failed to identify whom she spoke to and whether she even spoke to the grandparents. The officer erred in focusing on the parents’ actions and not addressing the applicant’s primary submission, which was that the grandparents could not longer care for him and there were no other family members willing to take over his care. Tamrat Gebeyehu, for the Respondent. MANDAMIN J.:– Mr. Harshkumar Jayeshbhai Patel applies for judicial review of a Visa Officer’s June 10, 2011 decision refusing his application for permanent residence as a member of the family class according to paragraph 117(9)(d) of the Immigration and Refugee Protection Regulations(Regulations). The Applicant, a minor, was sponsored for permanent residence as a member of the family class by his mother. The Applicant challenges the Officer’s decision that insufficient humanitarian and compassionate (H&C) grounds exist in order to overcome the Officer’s s. 117(9)(d) finding. The Applicant is a 17 year old citizen of India. His father, Mr. Jayeshkumar Patel, was sponsored to immigrate to Canada as part of a family class sponsorship commenced in 1989. However, the Applicant’s father did not become a permanent resident of Canada until 1997. In the period of time between the application for permanent residence in 1989 and obtaining permanent residence in 1997, the Applicant’s father was involved in a relationship with the Applicant’s mother in India. The Applicant was born in India in 1994. The Applicant’s father did not declare the Applicant as a family member when he became a landed permanent resident. In 1998, the Applicant’s father returned to India and underwent a civil marriage with the Applicant’s mother. The Applicant’s father then sponsored the Applicant’s mother who also did not disclose the fact that they had a child. Once the Applicant’s father became a Canadian citizen, he attempted to sponsor the Applicant for permanent residence. The application was refused as the son was not declared as per s. 117(9)(d) of the Regulations. 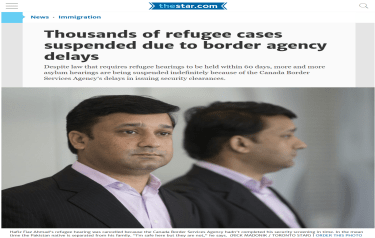 An appeal was made to the Immigration Appeal Division but was dismissed. A second sponsorship application was made with an accompanying H&C request. This second application was refused on January 22, 2010. The Applicant’s mother sponsored their son in this third application for permanent residence. This application also included an H&C request. The Applicant’s mother submitted that the Applicant has been residing with his paternal grandparents in India who were aging and have said they can no longer take care of the Applicant. The Applicant’s mother also submitted that there were no immediate family members who could bear this responsibility and that the Applicant’s parents longed to be re-united with the Applicant. The latest application was refused on June 10, 2011. The Officer found that the Applicant remained inadmissible as per s. 117(9)(d) and that an exemption under s. 25(1) for H&C considerations was unwarranted. The Officer’s decision is contained in the refusal letter dated June 10, 2011, the Global Case Management System (GCMS) notes and a three and a half page summary of reasons for the decision written by the Officer but produced later. According to the Officer’s affidavit, these three and a half pages were written after her review of the application and obtaining additional information from the grandparents in India by telephone. The Officer reviewed the Applicant’s parents’ immigration history in Canada and noted neither parent declared the Applicant on their permanent resident applications or at the port of entry. The Officer rejected the various excuses offered by the Applicant’s parents for not earlier disclosing the Applicant’s existence. The Officer found the Applicant excluded as a member of the family class pursuant to s. 117(9)(d) of theRegulationssince he was not declared or examined when the father and the mother each applied for permanent residence. The Officer then considered the Applicant’s request for H&C consideration. The Officer noted the Applicant submits that the Applicant lives with his paternal grandparents in Gujarat, India but they are aging. The grandparents indicated that they can no longer take care of the Applicant and there are no immediate family members who can assume this responsibility. The Applicant’s parents long to be re-united with their son. The Officer made telephone enquiries at the homes of the Applicant’s paternal and maternal grandparents. She learned the Applicant attends the Swaminarayan School and stays in the school hostel. The Applicant returns to his paternal grandparents’ home during school holidays. The Officer noted other family members live in the paternal grandparents’ home. The Officer also found the Applicant’s parents can communicate with the Applicant on the telephone and can visit him in India periodically. The Officer decided the Applicant’s parents are away from their son because they chose to leave him in India and go away to Canada. The Officer stated that the situation they find themselves now in is the creation of the parents’ own actions and misrepresentations. The Officer also observed that it is not unusual for children to live in hostels away from parents in hostels because parents want their children educated in schools located elsewhere. Given the above, the Officer did not believe that an H&C exemption under s. 25 was justified taking into account the best interests of the child. The Officer refused the application. (1) Subject to subsection (1.2),the Minister must, on request of a foreign national in Canadawho applies for permanent resident status and who is inadmissible or does not meet the requirements of this Act, and may, on request of a foreign national outside Canada who applies for a permanent resident visa,examine the circumstances concerning the foreign national and may grant the foreign national permanent resident status or an exemption from any applicable criteria or obligations of this Act if the Minister is of the opinion that it is justified by humanitarian and compassionate considerations relating to the foreign national, taking into account the best interests of a child directly affected. (1) Sous réserve du paragraphe (1.2), le ministre doit, sur demande d’un étranger se trouvant au Canada qui demande le statut de résident permanent et qui soit est interdit de territoire, soit ne se conforme pas à la présente loi, et peut, sur demande d’un étranger se trouvant hors du Canada qui demande un visa de résident permanent, étudier le cas de cet étranger; il peut lui octroyer le statut de résident permanent ou lever tout ou partie des critères et obligations applicables, s’il estime que des considérations d’ordre humanitaire relatives à l’étranger le justifient, compte tenu de l’intérêt supérieur de l’enfant directement touché. subject to subsection (10), the sponsor previously made an application for permanent residence and became a permanent resident and, at the time of that application, the foreign national was a non-accompanying family member of the sponsor and was not examined. sous réserve du paragraphe (10), dans le cas où le répondant est devenu résident permanent à la suite d’une demande à cet effet, l’étranger qui, à l’époque où cette demande a été faite, était un membre de la famille du répondant n’accompagnant pas ce dernier et n’a pas fait l’objet d’un contrôle. failed to consider humanitarian and compassionate considerations taking into account the best interests of a child directly affected. The Supreme Court of Canada has held in Dunsmuir v New Brunswick, 2008 SCC 9 at paras 50 and 53 [Dunsmuir] that there are only two standards of review: correctness for questions of law and reasonableness involving questions of mixed fact and law and fact. The Supreme Court has also held that where the standard of review has been previously determined, a standard of review analysis need not be repeated. Dunsmuir at para 62. The appropriate standard of review for a decision on H&C grounds is reasonableness.Baker v Canada (Minister of Citizenship and Immigration),  2 SCR 817,  SCJ no 39 at paras 57-62 [Baker]. A heavy burden rests on the applicants to satisfy the Court that the decision under section 25 requires the intervention of the Court. Mikhno v Canada (Minister of Citizenship and Immigration), 2010 FC 386,  FCJ no 583 (QL) (TD) at para 25 [Mikhno]. However, it is also clear that breaches of procedural fairness should be reviewed on a standard of correctness.Dunsmuir at paras 47-50. The Applicant submits the Officer failed to address her mind to the principal reason for seeking an exemption on H&C grounds: the Applicant’s current caregivers, his paternal grandparents, are aging; they have indicated that they can no longer take care of the Applicant; and there are no other immediate family members who are willing to assume this responsibility. The Applicant also submits the Officer telephoned the homes of the Applicant’s grandparents and collected information. The Applicant submits the Officer made negative inferences from the information collected. Thus it was incumbent upon the Officer to make her concerns known to the Applicant and his mother, the sponsor, and give them the opportunity to respond. The Applicant submits the failure to do so constitutes a reviewable error. The Respondent states that the parents failed twice to disclose the existence of the Applicant on their applications for permanent residence in Canada. The current proceeding deals with a failed request to have the parents’ misrepresentations overlooked and to approve the Applicant’s application on H&C grounds. The Respondent submits the Officer considered all the circumstances of the case and determined there were insufficient H&C grounds to approve the request. The Respondent submitted the standard of review is reasonableness and emphasized the discretionary nature of a s. 25(1) H&C decision. The Respondent submits the application for judicial review should be dismissed. I find no issue arises with the Officer’s determination that the Applicant is excluded from being considered a member of the family class as per s. 117(9)(d). The record is quite clear that both parents failed to declare the Applicant’s existence on either of their applications for permanent residence. I also find no error in the Officer’s rejection of the explanations for non-disclosure advanced by the Applicant and his sponsor. The only issues in this case are whether the information the Officer received via the telephone calls to the paternal and maternal grandparents was extrinsic evidence that ought to have been put before the Applicant, and whether the Officer rendered her negative H&C decision without consideration of the Applicant’s H&C submission. According to the Officer, she made calls and spoke to ‘family members’. She learned that the Applicant attended the Swaminarayan School and stayed in the school hostel. The Officer discovered that the Applicant returned to his parental grandparents’ home during school holidays. The Officer also discovered through the telephone calls that the Applicant’s paternal uncle, his wife, two sons and a daughter also live in the paternal grandparents’ home. The information obtained by the Officer from the telephone call to the grandparents would not be extrinsic evidence since it would be information which is readily accessible to the Applicant and his mother.Nadarajah at para 7. However, a difficulty arises. First, the Officer does not identify the family members who are the source of information obtained. She spoke to someone at the maternal grandparents’ home, a different household. Other individuals resided at the home of the paternal grandparents. In short, we do not know if the Officer spoke to the paternal grandparents. It is they who are said not to be able to continue to care for the Applicant. At best one can only infer the Officer drew a negative inference from the information collected from individuals described as family members. Second, the Officer does not address the submission the paternal grandparents could not provide care for Applicant and no other immediate family members were willing to assume that responsibility. At paragraph 8 of her affidavit, Mrs. Patel asserts that I made no reference to the fact that the son’s parental grandparents are too old to continue to look after him in India.I considered this factor but noted that the son, who was left behind by his father and mother when he was 3 and 4 1/2 years old respectively, was 17 at the time of the decision.During school years, he stays in the school hostel and lives with his paternal grandparents during school vacations. It is not unusual these days for children to live away from parents in hostels because they want their children educated in schools located away from the parents’ home. Many parents send their children to developed countries for higher education. In any event, the reason the parents are away from their son is because they choose to leave him in India and go away to Canada. The situation they find themselves now in is the creation of their own actions/misrepresentations. This statement cannot be accepted since the Officer is impermissibly bolstering the record of decision. That record does not disclose any analysis of the submission the grandparents were too old to look after the Applicant and no other immediate family members were in position to assume that responsibility. In my view, the Officer failed to address her mind to the principal reason for the H&C application on behalf of the minor Applicant. The Officer focuses on the actions of the Applicant’s parents in leaving the Applicant behind in India. The Officer’s summary never addresses the submission that the paternal grandparents who have been the Applicant’s caregivers are no longer willing to do so. In my view, these ‘reasons’ are not really reasons at all, essentially consisting of a review of the facts and a statement of a conclusion, without any analysis to back it up.That is, the officer simply reviewed the positive factors militating in favour of granting the application, concluding that, in her view, these factors were not sufficient to justify the granting of an exemption, without any explanation as to why that is.That is not sufficient, as it leaves the applicants in the unenviable position of not knowing why their application was rejected. In this case, the Program Manager omitted even a perfunctory weighing of the H&C factors. While the applicant’s conduct was a negative and important factor relevant to the weighing, his conduct does not obviate the need to consider the H&C evidence. Indeed, if the applicant’s misrepresentation were the only factor to be considered, there would be no room for discretion left to the Minister under section 25 of the Act. In the result, this application for judicial review is allowed. The decision of the Program Manager is set aside and returned for reconsideration by a different Program Manager. It was open for the Officer to consider the submission and come to a decision one way or the other. It is not open to the Officer to recite and thereafter disregard the submission entirely. For the Officer merely to repeat the Applicant’s submission without analysis is to fail to consider whether an exception to the IRPA criteria is justified by humanitarian and compassionate considerations taking into account the best interests of a child directly affected. I find the Officer failed to address a central basis for which the H&C application was made. The application for judicial review succeeds. Neither party proposed a question of general importance for certification. The application for judicial review is granted. The matter is remitted for re-determination by a different visa officer.